Fiona Donohue-Bales did one-to-one business coaching with me some four years ago, and participated in our last intake of the Hustle & Heart program, in September 2017. Here’s her story. I began my business around 18 years ago in the year 2000, when my kids were still in nappies! I started out fuelled by passion and a desire to share my love of yoga with as many new mothers as I could. Back then it was very much a ‘hobby’ business that allowed me plenty of time to be with the kids. Over the years that little hobby business continued to grow organically alongside my growing family. I consider myself first and foremost a practitioner. Although I have an entrepreneurial spirit I feel like I’m in business by default, like so many of us do. Self-employment also suits my personality – I love the freedom, flexibility and creativity it can bring and I have a particular vision of what I want to deliver and how I want to deliver it. Yoga has always been a huge part of my life ever since my early teens. 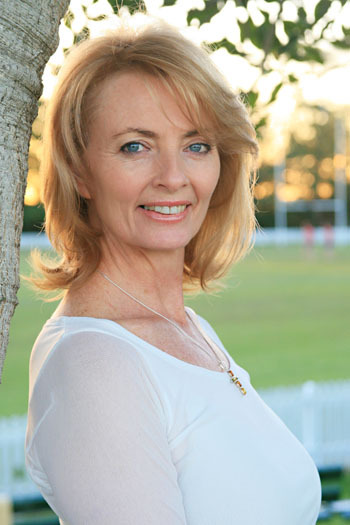 I’ve specialised in prenatal and postnatal yoga for the past 20 years and am also a qualified counselor, mindfulness teacher, public speaker, podcaster and yoga therapist. I love what I do but the marketing aspect can be challenging. I’d rather just concentrate on working in my business than on my business. However, the reality is that if you want to get your message out there to the people you really care about it helps to have the marketing savvy to navigate what has become an increasingly crowded market. I’ve known Brook for a long time and had had one-to-one business coaching with her some years ago. I’d had a few other business coaches and done other business programs and hadn’t had quite the same kind of results. When I saw the Hustle & Heart program I knew immediately that I would be with other like-minded souls under the stewardship of a bright, thoughtful and caring facilitator. Being in business can sometimes be a lonely world, especially as a solo practitioner. It’s easy to get confused, lack direction from time to time and become overwhelmed by all the possibilities of what you can and can’t do! In contrast, in the corporate world you can always ask for, and receive direction guidance and input from colleagues. I was looking for a community with a leader who had insight and experience to draw from. It’s clear to see that a lot of care, love and years of experience have gone into the Hustle & Heart program. The weekly course modules are delivered in do-able bite-sized chunks. One of my biggest obstacles in business is feeling stuck from lack of confidence and doubt. Right from the start, the modules got me reflecting, moving and acting. Brook has a calm, steady presence and she makes her clients feel valued and included. Brook’s tone is direct, authoritative, discerning yet always warm and compassionate. The main thing is she ‘gets it!’ She knows what it’s like to be in business, have a family and have dreams and a vision for a better world. When I opened the first Hustle & Heart module about money, and particularly Brook’s concept of elegant sufficiency, I knew I’d made a good decision to join the program. Brook doesn’t just care about business, she cares about people’s best interests. She understands that everybody has unique needs and she doesn’t try to influence their goals or encourage them to want a particular business model. I loved the way the program was broken down into modules and lessons. I like to take my time to chew on new ideas and think things through. It feels like every detail has been thought through and organised into bite-sized chunks, which makes it approachable and so much more do-able. My nature is to be very ideas-led. I tend to get overwhelmed from time to time so I really appreciated the structure and organisation of information. The program is so comprehensive and Brook has really thought about every detail. I also really enjoyed all the different formats and how all our different learning styles were catered for with different types of exercises through video, writing exercises and group calls. Even so, I, like a few others, struggled to keep up with the weekly modules and felt a bit anxious about falling behind. Brook was very reassuring. She reminded us all that it wasn’t a race, that we could disregard lessons that weren’t relevant right now and take our time with things. Her insights into the nature of the creative mind and the need to ship, even when we felt insecure about whether or not it was good enough, were invaluable. I really love the fact that I have access to the program for as long as it’s running and can go through it with future groups of people, receiving the same email prompts at the same time and participating in future group calls, too. Since the program, my attitude towards business has had a makeover! It’s influenced the way I think about money and given me a far more practical way of approaching things. I’ve made some positive changes to my website since taking the program and had more inquiries, including more inquiries from new dads about my Active Birth workshops, which is fantastic. I’ve just co-hosted my first pregnancy retreat and was recently asked to speak at the Yoga Australia Conference in Melbourne, in the mental health stream, which is really exciting. I’m excited about the future. I want to further use my qualifications in counseling, psychology, Mindfulness and podcasting to help both women and men explore more deeply the way we birth, care for our children and each other and for our precious planet. As mature adults, we don’t want to be told what to do in business, but shown how to do things for ourselves, without compromising our highest values or our deeper desires. It’s this respectful, progressive approach that makes Hustle & Heart unique. The online community has been fabulous, with a few familiar faces, as well as new friends. I’m looking forward to meeting people face-to-face at our regular meet-ups and really enjoy having a community to like-minded souls to grow with. Asking for the right help is not something a lot of independent women in business, like myself, are inclined to do, but it’s vital to taking the next step to grow your business in a sustainable, profitable and meaningful way. Hustle & Heart is open for a short time right now for registration! Act now.